One of the unique things about MapsIndoors is the easy third party integration. Indoor navigation is useful but it’s even more useful if you interface it with other systems. That’s why we’ve developed MapsIndoors as a platform that allows customers to customize it to fit their exact needs. But it gets better. If you already have an app with lots of users, there is no reason for adding yet another tool. Bring the functionality to where the users are and integrate MapisIndoors directly into your existing solution. The key product may be “just” a map, but the possibilities go way beyond wayfinding. No one wants to miss 30 minutes of a football match just to get a tasty meal or a cold beer. With MapsIndoors you can interface indoor navigation with real time waiting times. By integrating the platform with a third party system that tracks waiting times, fans are equipped with the estimated waiting time for all food and drink vendors at the palm of their hand. And if the line is too long, MapsIndoors shows nearby alternatives so fans never have to miss out on game highlights. This integration is also useful in airports, convention centers, shopping malls etc. where people are likely to get in line at at the same time. Another well known scenario is the (impossible) search for an available parking space. Whether it’s at the airport, stadium, hospital, or another well-visited venue, finding a parking spot is like finding a needle in a haystack. With MapsIndoors users get the complete route from their front door to their destination. 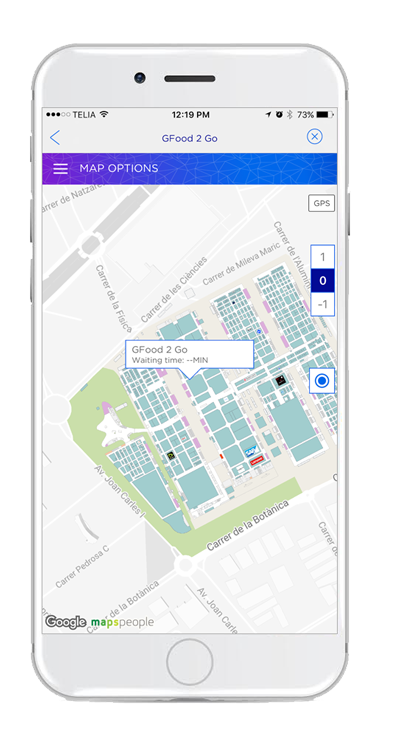 This includes outdoor navigation from their home to your venue but it also includes directions to available parking spaces if you combine it with the system tracking your parking areas. At Copenhagen Airport, on of the busiest airports in the Nordic with 30 million passengers annually, air travelers never have to stress about finding a parking spot. 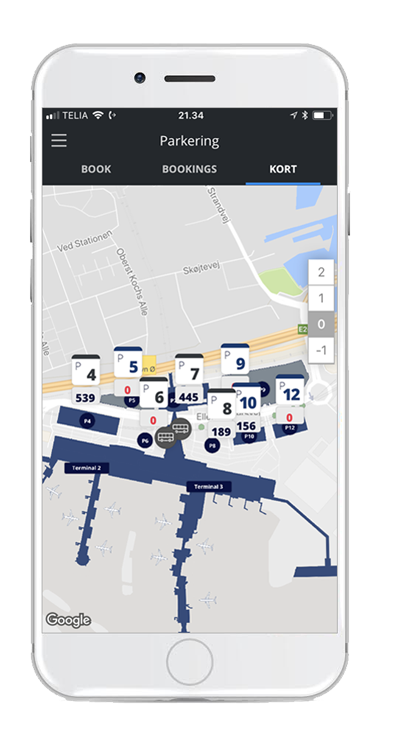 As the airports has integrated MapsIndoors with the car parking system, passengers can get an overview of the availability in the different parking areas even before arriving at the airport. Once parked the solution navigates them from the car to the entrance closest to their end destination inside the airport. MapsIndoors and indoor positioning is a useful combination in more than one way. First of all it provides the blue dot experience that some people prefer. Second of all it opens the door to location based marketing. Location based marketing can boost sales and increase revenue in any industry and venue. Think of the possibilities within retail. A customer is standing in the pasta aisle. Why not push him or her a notification with the recipe for two different pasta dishes including special offers on key ingredients? If the customer gets inspired and decides to go with the recipe for, for instance, spaghetti bolognese, you’ve sold one or more additional products and gained important customer insight. By doing this regularly you’ll get to know your customers which empowers you to create even better personalized experiences and gain their loyalty. With an indoor positioning system you can also gain insight on people flow thanks to heat mapping. This allows venue to constantly update and improve their layout based on people flow and convention centers and shopping malls can differentiate stand/shop pricing according to the amount of attentions these are getting from visitors. MapsIndoors can also be interfaced with time schedules and calendars. Universities and corporate offices are often large and complex buildings that may spread across an entire city. With indoor navigation you allow students and employees to easily navigate your spaces, but by integrating time tables and emails, you can make their lives even easier. These integrations let you provide students and employees with all the information they need when they need it. This means that directions will be available directly from the calendar by clicking on the meeting or class. Other useful combinations at offices and universities are indoor navigation and shared desks and study spaces. University students often struggle to find an available study space even though many spaces are left unused. With MapsIndoors students can get a clear overview of available study spaces. Likewise employees can get a clear overview of available shared desk at their office so no time is wasted searching for a place to work. If you want to know more about what we can do for your venue, click the buttons below to explore MapsIndoors and discover our industries.